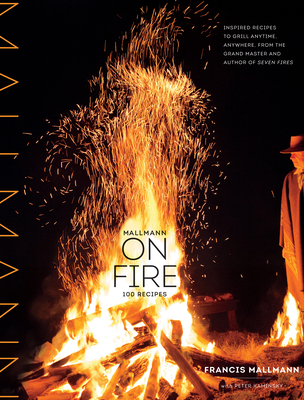 “Elemental, fundamental, and delicious” is how Anthony Bourdain describes the trailblazing live-fire cooking of Francis Mallmann. The New York Times called Mallmann’s first book, Seven Fires, “captivating” and “inspiring.” And now, in Mallmann on Fire, the passionate master of the Argentine grill takes us grilling in magical places—in winter’s snow, on mountaintops, on the beach, on the crowded streets of Manhattan, on a deserted island in Patagonia, in Paris, Brooklyn, Bolinas, Brazil—each locale inspiring new discoveries as revealed in 100 recipes for meals both intimate and outsized. We encounter legs of lamb and chicken hung from strings, coal-roasted delicata squash, roasted herbs, a parrillada of many fish, and all sorts of griddled and charred meats, vegetables, and fruits, plus rustic desserts cooked on the chapa and baked in wood-fired ovens. At every stop along the way there is something delicious to eat and a lesson to be learned about slowing down and enjoying the process, not just the result.